Retail Artificial Intelligence will shape the future of retail, as customers will effortlessly receive an optimized, personal and rewarding in-store shopping experience. Those who eagerly anticipate the opening of the Amazon Go store, ask themselves if this is how machine learning will shape the future of retailing; further, how far off is the day when customers enter a store and effortlessly receive an optimized, personal and rewarding in-store shopping experience? We are now all too familiar with how Deep Learning is changing the way we drive cars (or we don’t drive them), manage our health, purchase goods online and much more. But how will Deep Learning impact the shopping experience in the real physical world? To answer that question, lets look at some factors that make this either a nearby or far off reality. Interestingly, consumers welcome a change: Sonar (J. Walter Thompson’s proprietary research unit), reveals that consumers are interested in how Retail Artificial Intelligence will be used : 70% of US millennials, and 62% of millennials in the UK, say they would appreciate a brand or retailer using AI technology to show more interesting products. Furthermore, 72% and 64%, respectively, believe that as the technology develops, brands using AI will be able to accurately predict what they want. 1. 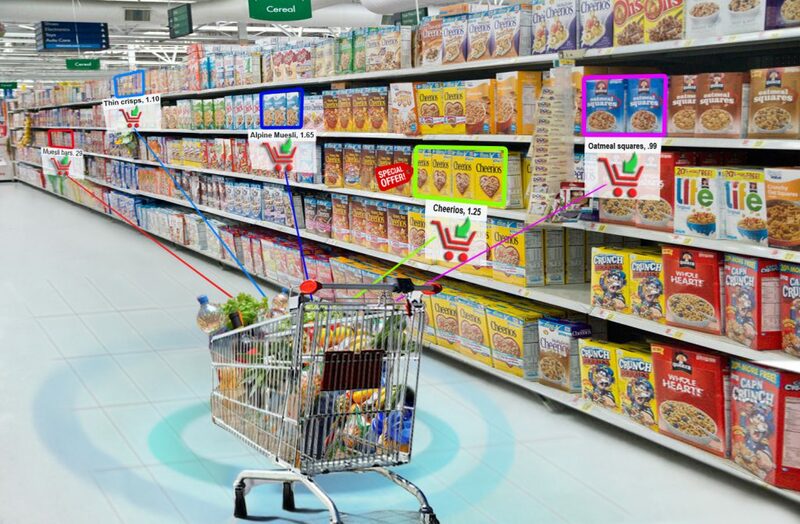 The availability of a variety of in-store sensors to live stream shopper and product data: cameras with product detection and facial recognition capabilities, sensors for location and shopper journey tracking, product shelf pressure detection and laser (Lidar) systems, all act as in a sensor fusion mode for algorithms to learn. 2. Advances in GPU accelerated computing power enables deep learning algorithms to find patterns in large and disparate data sets: further, to take action in near real time for more efficient retail operations and a much better shopping experience. 3. Retailers start to recognize that they have to create more meaningful and relevant customer engagements and that traditional statistical and marketing methods using only purchase history and demographics fail to account for evolving consumer preferences. Traditionally, retailers use a standard way to segment consumers based on their spend history that uses rule based algorithms (e.g. Recency-Frequency-Money Value scoring). Additional clustering by demographic data obtained and attitudes towards products and services based on product attributes provides the means to predict future purchases. The underlying assumption is that spend behavior patterns repeat themselves. The flaw in traditional analytical methods is that rule based models deal with limited and often outdated data sets; also, metrics that are outputted don’t show how they are associated. For example, if promotional redemptions have gone down, is that because of the price offer, poor customer targeting, merchandise placement, low product sentiment, loyalty program rewards, weather conditions? Which variables are most likely the cause? The above example clearly illustrates the problem of looking at metrics in isolation of each other and not being able to know the co-relations between them. Importantly, traditional models don’t automatically adjust for changing behavior patterns and interests, resulting in decreased relevance over time. Simply put, as time goes by, the customer model becomes less accurate and exhibits diminishing returns. For example, a customer whose purchase history regularly includes gourmet ice cream and deserts may be associated to the group ’Gourmet Food Buyers’ and receive offers and rewards based on probabilities of repeat purchases in that category. However, imagine that sensors show that this customer no longer includes this category in his/her shopping journey; further, it finds Likes on Facebook for dietetic, sugar free desert products and brands. Deep Learning algorithms would rapidly create a different view of the customer as a result of finding linked behavior patterns that a fixed rule approach would not detect (at least, for an extended time period). As a further step, a Retail Artificial Intelligence based marketing engine would start talking to the customer on the retailer’s new dietetic product offerings and the health benefits for a low sugar diet; in contrast, the traditional model would keep sending coupons on the very products the customer no longer desires. Just like a car auto-pilot detects road hazards and further takes the right action faster than a human can (recent findings by the NHTSA shows that Tesla auto-pilot reduced auto crashes by an astonishing 40 percent), an AI based marketing engine continuously evolves to create more relevant and personalized shopper communications. Within their current means, marketing department personnel supervise opportunities for engaging customers and create targeted marketing campaigns based on their best judgment. In addition, use communication channels that don’t reach the customer at the moment he is looking at products and making a purchase decision. These type of limitations mean, for example, that a wine offer may reach a customer only after a shopping trip and when home drinking wine at dinner. Just as online retailers utilize programmatic marketing, bricks and mortar retailers implementing sensor fusion and Deep Learning technologies are in a position to deliver accurate, just in time information across touch points – to the benefit of consumers, brands and retailers. Planograms, merchandising, product range assortment, pricing, supply chain, store personnel and store location – all together play a part in the customer experience. However, retailers have only a very superficial understanding of how these variables, sometimes in concert, impact on how customers shop their stores. Did moving the bakery section to the front of the store result in customers spending more time in the store? Did moving the wine section next to the cheese counter create more cross shopping between those 2 categories? When additional personnel was directed to the shoe department at the time when an increase in shoppers was detected, did we convert more sales? The ‘one size fits all’ planogram deployed across all stores fails to consider that consumers and their shopping behavior differ by point of sale. Sensor fusion and Deep Learning can provide a level of diagnostics and insights that uncover which variables are working together to influence how shoppers make purchasing decisions. Further, suggest planograms and product assortments that target shopper preferences during their shopping journey, as well as optimizing pricing strategies and forecasting demand for better customer service. A question posed at the start was how far away are we from seeing retailers implement this? Having a wide range of experience in the area, I see a mix of the good and the bad. The bad news is that not that many retailers are ready to invest and change organizational practices in order to innovate. The good news is that market pressures and technology led changes are being implemented much faster than anyone could anticipate (Sergey Brin recently stated that “This revolution, has been very profound and definitely surprised me even though I was right in there”. I believe that leading retailers who have been using traditional customer insight analytics in their marketing practices will be the first ones to adopt. As far as timing is concerned, we normally go through a full cycle validation with a retailer in about 6 months and then are ready to scale out. Short answer: yes, this is right around the corner. Retailers who have implemented SMI’s Deep Learning platform and installed SMI’s sensors have derived immediate benefits.